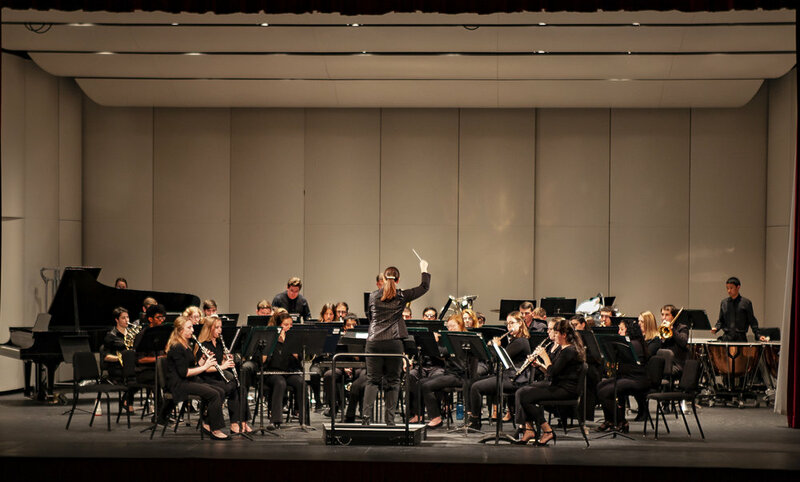 The Geneseo Wind Ensemble (pictured above in 2018) performed at the Geneseo Genesis: New Music Series on Thursday April 4. Geneseo Genesis brought a range of unusually experimental music to the campus (Udeshi Seniveratne/photo editor). Geneseo Genesis: New Music Series welcomed audience members to drastically new music and caused a range of emotions, varying from enlightenment to discomfort, all in the name of music. Conductor Leah McGray warned the audience in advance that what they were about to hear strayed from music’s normal path, and they might become uncomfortable, but that it was okay. The show started with a piece composed by Afarin Mansouri, McGray’s close friend. According to McGray, Mansouri is an Iranian Canadian composer and there was too much risk of getting detained at the border, even though she is a Canadian citizen, for her to come and watch her piece be performed. Mansouri’s piece, along with its instrumental elements, made audience members a little disoriented as they tried to decide which aspect and instrumentalist to focus on. Even though her ensemble piece “Praise” involved so many elements, it certainly caused listeners to be more open about different forms of music and realize that music is subjective. While the Geneseo Wind Ensemble performed throughout the night, the second piece brought staff to the stage to perform Overture to “And the Moon Be Still As Bright.” This was the world premiere of that piece, composed by Geneseo’s very own student composer political science major senior Timothy Snyder. Snyder has written many pieces during his time here at Geneseo and was able to have his own work showcased in the special event. “Firecracker” was later performed with oboe instructor Megan Kyle on the oboe. This piece was less abstract, but it still fit in well with the rest of the repertoire. The oboe was the “firecracker” of the song and Kyle illustrated it with much visible effort. Her face quickly became bright red as she tirelessly delivered each and every note to the audience. The night’s biggest shock was by far “Kyklos” by Paul Zonn. The piece is intended to represent different forms of government but is very much open to interpretation. The musicians were given a two-page set of rules on how to play this specific piece, but it ends with the statement that it is also up to interpretation by the reader. The event’s program featured the sheet music of “Kyklos” on the front and just looking at it from afar is beyond mind-boggling. Students had the choice of following any staff line they desired and could even hold notes for any length of time. Music education and performance major freshman Elijah Reed played clarinet in the concert. The show was eclectic, but people of varying interests were able to enjoy it. Physics major freshman Luis Yanez found the show interesting. The music certainly subverted traditions, but the musicians worked hard to learn and perform it for an audience that seemed rather accepting of the performance. McGray thanked the audience at the night’s conclusion and only hoped that everyone took something away from the performance and would explore less-common compositions of music in the future.